.An Alutin bearing shell installed on a Javelin front main bearing support. Our thanks to the Glacier Bearing Co. and to the late John Taylor who took the trouble to keep this information for our club. It was typed into Word 2003 from a faint photocopy by Mike Allfrey. 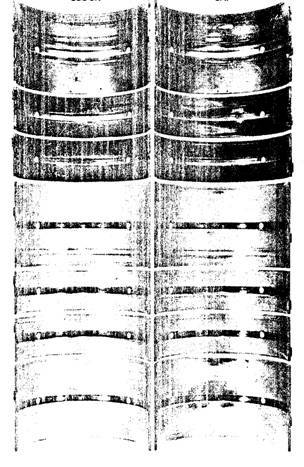 From the Automobile Engineer, June 1958 – Reprinted by The Glacier Metal Co. Ltd.
For some years, aluminium alloys have been used for crankshaft main and big end bearings. In England considerable experience has been gained in the use of bearings of aluminium alloyed with 5-7 per cent tin, without steel backings, in diesel and petrol engines. These alloys, which were introduced in about 1936, initially showed great promise in that their frictional and wear characteristics appeared to be considerably better than those obtained with any previously used aluminium alloys. Indeed, in some cases they were used on soft shafts, seemingly without trouble. They were adopted by one or two important manufacturers of diesel engines who used them fairly extensively. Gradually, however, troubles began to develop. Occasionally there were seizures of a very serious nature, resulting in considerable damage to the engine. Experience also showed that the yield strength of these alloys was insufficient to enable bearings to maintain an adequate interference fit in main bearing housings and connecting rods. There were cases of dowel holes gradually being elongated until location of the bearing was lost to such a degree that oil feed holes were throttled. One manufacturer, who had used these bearings extensively, had to replace all of them with a different type. Extensive experience showed that this aluminium alloy containing 5-7 per cent tin was not satisfactory as a compromise between the two opposing requirements. These requirements are: low wear characteristics, which call for additions of tin or other low melting point metal; and higher strength, which can only be achieved by reducing the tin content. It became clear that one solution might well be along the lines of a considerable increase of tin content, to improve the anti-scuffing characteristics, and the bonding of this high tin alloy to a steel backing to increase the strength of the bearing. A great deal of work has been done in the United States with steel backed aluminium alloy bearings, and these have been used extensively for many years by one very large firm of diesel engine manufacturers. The alloy employed contains 6 per cent tin; however, success has only been achieved at the expense of hardening the crankshafts and by the maintenance of unusually rigid discipline with regard to limits, finish, cleanliness of the engine, etc. Even with such an approach, many diesel engine manufacturers have been unable to obtain satisfactory results in the use of alloys of this nature. One manufacturer in the United States has produced steel backed bearings lined with an aluminium alloy containing a small percentage of cadmium. However, this alloy is not wholly satisfactory as a bearing surface, so it is generally given an electro-deposited lead-tin overlay. In these circumstances, the aluminium alloy is not the bearing surface, but merely an interlayer. So far as the history of aluminium bearings in other parts of the world is concerned, the trends already outlined were also experienced by more or less independent operators in England and in Germany, as well as in the United States of America. EW Hives and F Llewellyn-Smith in the SAE Journal of December 1940 stated that Rolls-Royce car and aircraft engine big end bearings were of aluminium-based alloys containing 5-7 per cent tin, but lead-bronze was employed in the Rolls-Royce Merlin engines; the use of aluminium alloyed with 5-7 per cent tin for bearings was substantially limited to a car engine. The Rolls-Royce patent number 426211,dated 29th March, 1935, included a range of tin content from 8-19 per cent, but it is known that as-cast alloys containing over 10 per cent of tin are weak because the aluminium phase is discontinuous. Moreover, owing to the very rapid formation of brittle aluminium-iron compounds, the casting of the aluminium-tin alloy on to steel is not suitable for the manufacture of these bearings. 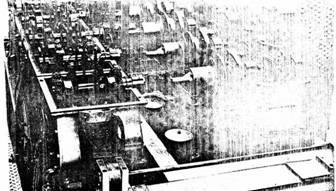 In the United States, Hunsicker, of the Aluminium Company of America, said that it was evident from extensive research that 20-30 per cent of tin was desirable in the aluminium, in order to obtain adequate anti-scuffing properties with cast alloys, but that the mechanical requirements of most bearings placed an upper limit of about 10 percent on the tin content of such alloys. As a result of the research, a series of well known alloys of high fatigue strength was developed, but these alloys were highly sensitive to dirt in the oil. The report on this work, entitled 'Aluminium Alloy Bearings – Metallurgy, Design and Service Characteristics', was published in the Journal of the American Society of Metals, 1949. From 1932 to 1943, development work with various tin-free or low-tin content aluminium-based alloys was carried out in Germany by the Karl Schmidt Company. In a report by Dr. Ing. Carl Englisch, experience similar to that of Hunsicker is described. Bench tests gave satisfactory and encouraging results, but road tests sooner or later showed failure by gross scuffing and seizure. 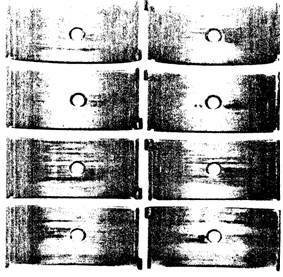 These tests also indicated that these bearings were excessively sensitive to external influences and that their successful use, in any case, would depend on a high standard of lubrication. This report is available as one of the Document Reprints of the Air Documents Division of Headquarters of Air Materiel Command, Wright Field, Daytona, Ohio. The reference number is MX1191 US Army Air Force Card Index (German Technology ADRC). It can be seen that two problems had to be solved before the full advantages of aluminium-tin alloys could be obtained. The first was the production of a high-tin aluminium alloy in which, to get maximum strength, the aluminium phase was continuous. Secondly, it was necessary to bond this alloy to a steel backing, without forming excessive aluminium-iron compound. 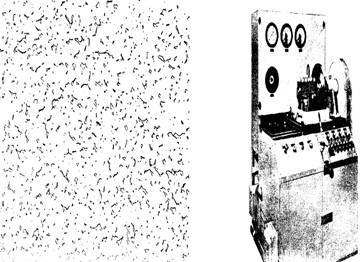 Of these two problems, the first was overcome as a result of work sponsored by The Tin Research Institute, at the Fulmer Research Laboratories. The second was solved jointly by The Tin Research Institute and the Glacier Metal Co. Ltd.; this was done some three years ago. During 1956, Glacier developed from a pilot plant a small production plant for making composite aluminium-tin-on-steel strip. This plant has been operating continuously for the last eighteen months. It is capable of making bi-metallic strip up to 0.10" (2.54 mm) thick, that is, a thickness adequate for the bearings of most engines developing up to about 200 bhp. A major production plant, having a capacity to make bi-metallic strip up to 0.20" (5.08 mm) thick is now in operation, so material is also available for the manufacture of bearings for large diesel engines designed for a wide range of different applications. Hydrodynamic – where oil is available at the entry to the converging region of the clearance space. Hydrostatic – where oil is supplied at pressures exceeding the specific load on the bearing in the appropriate region. Boundary – where the journal and bearing metal surfaces are separated by very thin films of oil, which are attached chemically to the journal and/or bearing metal or oxide surfaces. Break-down – where the journal and bearing metal surfaces are in contact. As regards hydrodynamic and hydrostatic conditions, the only property required of the bearing metal is strength to withstand the applied loads. That is, once the hydrodynamic film between the journal and the bearing is established, the surface properties of the journal and bearing metals are immaterial. Softness of the metal, however, aids the formation of hydrodynamic films, as do to a lesser extent certain other surface properties. It is with regard to boundary and break-down conditions that the surface properties of journal and bearing metals become of paramount importance and, as practically all journals and bearings have to operate at some time or other under these conditions, the metals must be appropriately chosen with regard to their compatibility in these circumstances. To operate under boundary conditions, the metal surfaces must be more than merely wetted by the lubricant: at least one of the surfaces must bond chemically to oily radical constituents in the lubricant, to form a molecular layer; moreover, should the layer be damaged as a result of metal-to-metal contact, it must be capable of being healed automatically. On evidence at present available, bearings alloys with a high free energy of oxide formation are more likely to be better in this respect than those that have a low free energy of oxide formation. Since the journal is usually of steel, the requisite properties must generally be inherent in the bearing alloy. Operation under break-down conditions is essentially of very short duration and inevitably modifies at least one of the sliding surfaces. The modification to one of the surfaces during breakdown conditions must be such as rapidly to alter the conditions so as to prevent significant damage to either of the two surfaces involved. Bowden has shown that when two metals are in sliding contact, the temperature reached is the melting point of the phase having the lowest melting point, and if this is substantially lower in one of the surfaces than the other, the effect for short periods is immediately to relieve high local specific loads and to prevent gross damage. Since the temperatures of sliding contact are so high, the metal constituents of the bearing alloy should not be prone to penetration of the journal material. Bowden has also demonstrated that in the case of a multi-phase material where one of the phases is fairly soft and has a relatively low melting point, the coefficient of friction is low and the effect in metal-to-metal sliding contact is to inhibit the occurrence of further damage. Hence, two-phase materials, in which one of the phases is soft and of low melting point, are advantageous as bearing surfaces. Since no material yet discovered is perfect in all respects, a compromise is unavoidable. Reticular aluminium-tin on a steel backing has a high fatigue strength and has relatively good anti-scuffing properties, as compared with other known bearing metals of high fatigue strength. The conventional white metal bearing alloys are not strong enough to meet many present-day requirements, and the most commonly used alternative is copper-lead. This is a two-phase material, but has a number of disadvantages. First, the copper phase has a high melting point and is rather hard. This leads to a high rate of journal wear, unless the journals are hardened. Unfortunately, the hardening process is usually expensive. Secondly, copper penetrates steel very rapidly and can cause shaft embrittlement, and there is a possibility of shaft breakage if any substantial or prolonged metal-to-metal contact occurs. The third defect is that, with certain modern oils, copper-lead is susceptible to corrosion, especially in engines where high sulphur content fuels are used. Copper also acts as a catalyst in the break-down of certain constituents of modern high-duty oils. Table 1 summarises the relative merits of conventional bearing alloys or composites, and some aluminium alloys, including reticular aluminium-20 per cent tin. Table 2 gives the comparative fatigue strength and wear data of the various materials. Although bearings of reticular aluminium, alloyed with 20 per cent tin, and steel backed, are relatively new, they have been applied successfully as original equipment to a wide variety of engines produced in both small and large quantities. Thus, the experimental results have been confirmed by the fact that hundreds of thousands of engine bearings made by The Glacier Metal Company Ltd are operating satisfactorily in service not only in Great Britain but also abroad. 1. Strength to withstand load. The ratio of fatigue strength relative to tin-base white metal, 0.015" to 0.020" thick, is shown in brackets. 2. Softness to initiate and maintain oil film. 1. Surface wettable by oil. 2. Chemical affinity for molecular layer of oily radical constituents. 1. Surface to have a low melting point phase. 2. The low melting point phase not to work harden and to be softer than the matrix. 3. Effect of 2-minute oil supply failure. 1. Bearing metal constituents must not be prone to grain boundary penetration in steel at their melting points. 2. Must not cause catalytic break-down of oil. 2.Tin-base white metal fair; lead-base white metal good. 1. The whole alloy has a low melting point. 2. The matrix has a lower melting point and is softer than the discontinuous phases. 3. Surface wipes and lining runs. 3. Tin-base white metal good; lead-base white metal fair. The main defect of white metal is its inadequate strength for many modern applications. 1. Good when bonded to steel (1.7 for copper-lead 70/30). 2. Poor to fair according to lead content. 3. Very high surface temperatures develop. Copper-lead is a good bearing material, by and large, but is a little too hard for use universally with soft crankshafts, and is susceptible to failure in certain environments, for example, severe edge loading. Copper-lead with overlay of lead-based alloy. 1. Good when bonded to steel (1.5 to 2.0 depending on thinness of overlay). 1. The whole of the surface alloy has a low melting point. 1. Good so long as overlay lasts. 3. Good in the presence of corrosion inhibitors, such as tin or indium, in the lead. If there is cavitation in the oil film, overlays occasionally wear or fatigue and leave a bare copper-lead surface with poor accommodation in many environments. 3. Is likely to seize. Aluminium-silicon is a good bearing material, except for its deficiencies in properties required for break-down conditions of operation. It is usually provided with a tin- or lead-based overlay. 1. Fair; the amount of the low melting point phase is marginal. The aluminium 6-9 per cent alloys are reasonably good, but the conditions of assembly and the standards of machining of both the journal and bearing surfaces have to be very good in order to overcome the defect of inadequate low melting point phase. For this reason they are probably unsuitable for large engines. Aluminium 20 per cent tin, reticular structure. 1. Good when bonded to steel (2.0 to 2.5 +)*. 3. Moderate surface temperatures but no seizure or serious change in dimension. Reticular aluminium 20 per cent tin can operate at much higher loads than white metal on a soft shaft, without the degree of journal wear that is experienced when copper-lead is used. Reticular aluminium 20 per cent tin also operates at surface temperatures that would cause white metal bearings to wipe, or would remove the overlay of plated copper-lead bearings. * The upper limits of fatigue strength of the three aluminium alloys referred to have not yet been established. The figures relate to values obtained to date. Average surface temperature 100 degrees C.
Shaft slope approximately 0.15 per cent. Lining thickness 0.015" – 0.020" (0.38 – 0.51 mm). Permissible stress at 100 degrees C is 4,000 psi on projected area. The effect of rise of temperature is low compared with its effect on white metal. At 150 degrees C the fatigue strength is at least 3,500 psi. Reduction of the thickness of the lining increases fatigue strength, but not so sharply as with low melting point alloys. At 0.007" (0.18 mm) thick, the fatigue strength is over 5,000 psi under reference conditions. Thinner linings have not yet been assessed. White metal: Permissible stress 3,000 psi at 100 degrees C, falling to about 1,500 psi at 150 degrees C.
70/30 Copper-lead: 3,500 psi falling to about 3,000 psi at 150 degrees C.
Reduction of thickness of lining to 0.007" (0.18 mm) increases fatigue strength of white metal to about 2,400 psi; at 0.004" (0.11 mm) the fatigue strength is about 3,000 psi. Fatigue strength of 70/30 copper-lead is also increased by reduction of thickness and is about 4,000 psi at 0.007" (0.18 mm). Thinner linings have not been assessed. The data are in terms of journal wear, expressed relative to operation with tin-base white metal. 70/30 Copper-lead: 2.3 times that obtained with white metal. Copper-lead with 90 per cent lead and 10 per cent tin overlay not less than 0.001" (0.0254 mm) thick: 0.9 times that with white metal. Aluminium-6 per cent tin-1 per cent copper-1 per cent nickel: 2.2 times that with white metal. Resistance to seizure or inter-penetration with journal material if oil supply fails. Aluminium will not penetrate intercrystalline boundaries of steel because its melting point, 660 degrees C, is less than the critical change temperature, of 768 degrees C, for steel. The high tin content, 20 percent, of reticular aluminium-tin alleviates the conditions where local surface damage is initiated in the event of oil failure. Copper, at its melting point of 1,083 degrees C, penetrates the intercrystalline boundaries of steel in fractions of a second. This can cause crankshaft failure. The lead in copper-lead alleviates the conditions at local surface damage areas, but cannot in the long run prevent copper penetration; nor can a lead-tin overlay do so. * These figures are based on tests in motor vehicles with shafts of hardness averaging about 200BHN. In more than 100 engine tests, it has been shown that the wear that takes place in the first 300 miles accounts for more than half the total wear in 3,000 miles. This is because the detritus produced in the engine and permitted to come down from the combustion chambers past the piston rings in the first 300 miles is very much larger in size than thereafter, when the controlling surfaces have been run in. with soft shafts, typical wear figures in long stroke engines are in the order of 0.0005" (0.013 mm) after 1,000 miles; 0.0008: (0.020 mm) after 11,000 miles and 0.0012: (0.0302 mm) after 33,000 miles. In engines where the bore stroke ratio approaches or exceeds unity, the wear rates are very much less than those quoted, and are in the order of 0.0001" (0.0025 mm) per 10,000 miles after the first 1,000 miles. With hardened shafts, the rates of wear are almost negligible, except in the most severe environments, such as with earthmoving equipment without adequate control of dust entry to the engine. From The Automobile Engineer – with thanks. Glacier 20% reticular aluminium-tin engine bearing material has been developed in recent years (approx 1967) by the Glacier Metal Company as a less expensive and in some cases superior alternative to trimetal copper-lead material for heavy duty main and connecting rod applications in high performance petrol engines and high speed truck diesels. Glacier 20% reticular aluminium-tin is a high strength homogeneous material with surface properties proved to be acceptable in engine types varying from small high speed petrol passenger car units (1 litre, 60 cu. Ins. capacity) to diesel truck units (11 litres, 670 cu. Ins. capacity). It is used for both connecting rod and main bearings and against crankshafts varying in hardness from 200 Brinell upwards. It is successfully used against both steel and nodular iron crankshafts. In Europe, as engine speeds and outputs rise, increasingly large quantities of Glacier reticular aluminium-tin bearings are used. In the United Kingdom alone the four major automotive companies, BMC, Ford, Vauxhall and Rootes, together with commercial vehicle and other engine manufacturers, have fitted Glacier reticular aluminium-tin bearings to nearly 6,000,000 engines up to mid 1967. 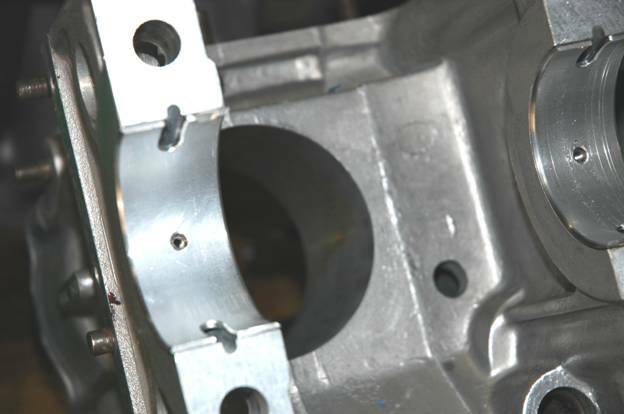 Engine development in Europe is proceeding along a path which, in a broad sense, imposes two quite different operating conditions upon the connecting rod and main bearings. The first condition is to be found in diesel engines which are highly rated either by means of turbo-charging, or by a sophisticated method of supercharging. Connecting rod bearings are subjected to a very high gas load often at low engine speeds and in such conditions the fatigue strength of the bearing material is critical. The peak unit load on the bearing, although of comparatively short duration, can be as high as 8,000 psi (55,160 kPa) and 10,000 psi (68,950 kPa) is under consideration. Glacier reticular aluminium-tin bearings are used in these engines. The second condition is found in high speed petrol engines used in passenger cars. An engine of this type when used at high speeds, say up to 6,000 erpm for long periods at sump oil temperatures in excess of 120 degrees Centigrade (250 degrees Fahrenheit) imposes a particularly severe bearing condition. The load is inertia inspired and although of a reduced magnitude compared with the first condition, say 5,000 psi (34,475 kPa), the load duration relative to the combustion cycle is extended. Extremely thin hydrodynamic oil films are generated and in such conditions, in addition to high strength, very good bearing surface properties are needed if acceptable bearing performance is to be achieved. Glacier reticular aluminium-tin bearings are fitted to these engines and perform with equal success. The specifications of a selection of current production engines to which Glacier reticular aluminium-tin connecting rod bearings are fitted are shown in Tables 1 and 2 on Page ??. The increase in the specific power output of internal combustion engines of all sizes has been spectacular in the last thirty years. Developments in materials, metallurgy, fuels and in the thermodynamic design of engines have been applied to increase the power obtained from a given size and weight of engine. This increase in engine ratings has been in part contributed to, and has in part required changes in the materials used for engine bearings. Glacier 20% reticular aluminium-tin bearings have been developed to satisfy, as far as any material can, the requirements of a bearing material for the engines of today. 1. High mechanical strength to resist the high, fluctuating pressures in the lubricant film. 2. High melting point to resist damage by high temperature lubricant film. 3. High resistance to corrosion to resist attack from degraded and acidic lubricants. 4. Good embeddability to absorb dirt passing through the bearing and prevent scoring at high loads. 5. Good conformability to yield easily when mating shaft is misaligned or misshapen. 6. Sufficient hardness to resist abrasive wear and to resist cavitation erosion. 7. Excellent boundary properties to resist seizure when the bearing is loaded but when speeds are not high enough to provide thick, hydrodynamic films. It is doubtful whether it would be possible to provide a material that has all these desirable qualities but any plans for developing a new bearing material must be made with these factors in mind. For a particular application, it is possible to ascribe physical values to all these properties. Mechanical strength, for example, can be defined in terms of the bearing not sustaining fatigue damage when a specific load above a certain value is applied for 100,000.000 loading cycles. Corrosion resistance can be defined in terms of the bearing suffering no damage when immersed in an oil of a certain acidity. Generally, however, the value of each of these factors will vary for different applications and the performance of a bearing material in a particular application will depend more on how the factors are combined together rather than to their separate effects. For instance, the apparent fatigue strength of a material in an application would be much affected by its hardness and conformability if it were being assessed in an engine whose crankshaft was subject to misalignment and deflection. Nevertheless, the effect of the factors individually is worth study and the reasons for the choice of the 20% reticular aluminium-tin material will be seen more clearly after an examination of the properties of its rival. PLEASE NOTE that The Glacier Metal Company makes no claim that quantitative data on bearing strength published here are in any way comparable to the data published by other bearing manufacturers who in general do not provide sufficient detail of the test rig conditions for their data to be useful. Despite all the development work in recent years, there is no bearing material which has all the desirable properties present to the extent that they were in the original babbitts for the conditions then pertaining. In corrosion resistance, embeddability, conformability and boundary properties, they have no rival. Unfortunately, their mechanical strength and therefore their fatigue resistance is low. Furthermore, their strength is reduced by increase of operating temperature so that in the high speed, high load operating conditions of the modern engine they find little place, although there are still a few applications in the more lightly loaded main bearings of some passenger cars. Their use here has persisted mainly due to their ability to run at extremely small bearing clearances and thus provide a bearing which is quiet in operation. The low melting point of the babbitts and the absence of any supporting metallic structure of higher melting point render them unsuitable from this aspect in high speed engines. When it became obvious to designers that babbitt was becoming inadequate, attention was turned to copper-lead materials. These contained between 20% and 30% lead with 2% to 4% tin being added to the lower lead alloys. These materials were much stronger than babbitt and thus could sustain higher engine loads, but they were also much harder. A typical figure for the hardness of babbitt, at normal operating temperatures, would be 20 Brinell, whereas the stronger copper-leads would be as hard as 60 Brinell. This greater hardness reduces seriously the embeddability and conformability of the material, with the consequent result that due to the inevitable crankshaft deflection in an engine and the necessity for the presence of the two above properties, the full load capacity of the material cannot be realised. Indeed some of the load capacities quoted for copper-lead can be obtained only in special test machines where shaft deflection and misalignment are absent. Another grave drawback of a plain copper-lead material is its poor corrosion resistance. In a highly rated engine it is difficult to maintain the oil in a neutral condition, but the lead phase of a copper-lead bearing is rapidly dissolved by acidic oil, removing from the bearing its boundary and wear-resisting properties. The disadvantages so far described can be eliminated, at least temporarily, by the use of electro-deposited overlays. These are either lead-tin or lead-indium and have a thickness usually in the range 0.0005" – 0.0015" (0.0127 mm – 0.0381 mm). These overlays are very soft and have excellent embeddability and conformability. Unfortunately, because of their low strength and their thinness, they can be rapidly removed by abrasive particles and their presence cannot be guaranteed without reference to the operating conditions and particularly the cleanliness of the engine. The overlays, although thin, are also liable to fatigue damage and, in some cases, the full load capacity of the copper-lead cannot be employed because of the possibility of fatiguing and thereafter removing the overlay and exposing the underlying lead phase to corrosive attack. It was in the light of these limitations that The Glacier Metal Company Limited decided to examine the possibilities of developing an aluminium-based bearing material. Aluminium bearing alloys were not new. In Germany, before World War II, there had been developed a range of alloys consisting of hard metallic compounds in an aluminium-base matrix with a structure similar to that of the tin or lead base babbitts. These alloys were exemplified by Quartzal which contained 2% to 15% copper. These alloys were widely used but they were very hard and embeddability and conformability were low, requiring hardened crankshafts, clean oil and good alignment. About the same time in Britain and in the United States, alloys were developed of aluminium containing up to about 7% tin, which are still widely used. The presence of tin reduced the solidus temperature of the alloy and Hunsicker showed in 1949 that the presence of increasing quantities of tin up to about 25% improved its seizure resistance. This effect is shown in figure 1. Unfortunately, with the addition of tin at these levels, the tensile strength, and the ductility fell off sharply due to the tendency of the tin to envelope completely the aluminium grains. This was unfortunate since the properties of the high tin alloys were extremely attractive. However, work sponsored by the Tin Research Institute at the Fulmer Research Institute in England showed that the envelopes of tin which surrounded the aluminium grains could be broken up by working and annealing. After this treatment the tin remained continuous along the grain edges, but not across the grain faces, so that a strong continuous aluminium-base matrix was established. The tin phase thus formed a network, and from this the term 'reticular tin' derived. The development of the bonding of this high tin alloy to a steel backing was carried out by The Glacier Metal Company Limited and the Tin Research Institute in collaboration and a roll-bonding process was established. The establishment of the alloy and the process has been described by Forrester to the Institute of Metals in 1960 and to the Institution of Mechanical Engineers in 1961. 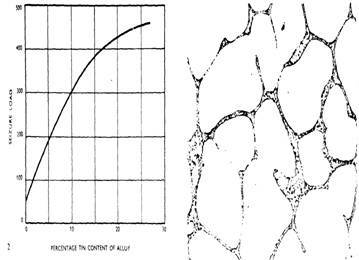 The decision on what aluminium-tin alloy to be used was based on consideration of the scuffing load curve, Figure 1, the cost of tin, and the required strength in the finished lining. It will be seen that the scuffing resistance is nearly at its peak at a tin content of 20%. It is higher at 30% tin, but at this level the tin content, involving a costly metal, has gone up by 50%. Further, due to the greater volume of tin in the alloy at the 30% level, the mechanical strength of the material, particularly at high temperatures, would be less than at the 20% level. All factors, then, pointed to 20% being the optimum tin content and it was fixed at this level. Figure 2 is a microsection of a 20% aluminium-tin billet before annealing and roll bonding to the steel backing. Figure 3 is a microsection through the finished material. The steel backing, aluminium foil layer 0.001" (0.0254 mm) thick and the now reticular aluminium-tin lining can easily be seen. aluminium on the seizure resistance. and unrolled. The first assessment to be made of the effective load-carrying capacity of the 20% aluminium-tin material was obtained in a test machine which loaded the bearing dynamically under conditions of operation which were as near ideal as could be obtained. 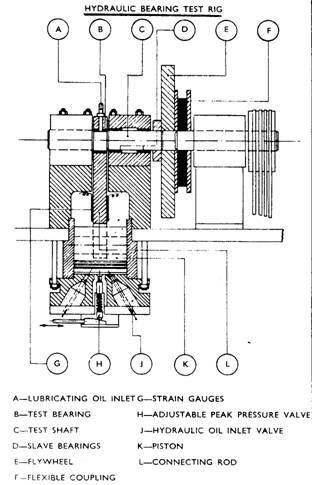 The machine is shown in Figure 4 and the system of loading the bearing can be seen in Figure 5. The machine is hydraulically loaded with the test bearing carried on an eccentric journal on a very stiffly supported shaft. There was negligible edge loading on the bearing and the dynamic load was unidirectional. The limit of loading for fatigue at 5 x 106 cycles for the 20% aluminium-tin was 6,400 psi (44,128 kPa). Comparative results obtained in this machine for other bearing materials are shown in Table 3. These tests indicated that an increased usable load capacity was being obtained and that the pattern and appearance of the fatigue damage did not suggest that the mode of failure would be different with this material from those in common use. Following this, another series of tests were carried out on another fatigue test machine, shown in Figure 6 and in detail in Figure 7. In this machine the load was applied to the bearings by a fairly flexible shaft which rotated at 4,000 rpm and carried two eccentric masses. The masses could be adjusted in weight and were capable of applying specific loads up to 10,000 psi (68,950 kPa) to each of the four test bearings which supported the shaft. 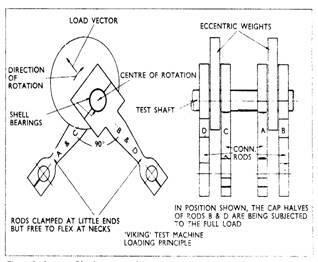 This machine, with its rotating loads and flexible shafts, applied a load to the test bearings which was more typical of that existing in an automotive engine and therefore the fatigue strengths of typical bearing materials was lower than in the other machine. In this case, the effective fatigue strength of the 20% aluminium-tin material was 4,500 psi (31,027 kPa). The comparative fatigues are shown in Table 4. It should be noted that the effective fatigue result for 70-30 copper-lead on steel in Table 4 is not consistent with that in Table 3. This is because of the shaft deflection and the rotating load in the second machine. The fatigue of the unplated copper-lead was aggravated by the occurrence of incipient seizure of the material. These results indicated that in terms of dynamic load capacity, the 20% aluminium-tin was equal to any of the other materials which had the overall combination of properties which made them suitable for use in internal combustion engines. It should be noted that in Tables 3 and 4, no strength comparisons are made with other materials which, although stronger, would have unacceptable wear or corrosion properties. The next property of the material to be examined was corrosion resistance and a lengthy series of tests was carried out with the 20% aluminium-tin bearings immersed in acidic and alkaline oils and additives. This work was done by Glacier and several oil companies, particular attention being paid to the effects of alkaline attack. This was because of the known effect of alkalis on aluminium itself, but no damage was sustained in any test. One of the most important properties of a bearing material is its wear performance exemplified by the wear of the material itself and also by the wear of the associated shaft material. To a large extent, the important wear figure in a bearing is the total change in clearance since this determines whether the engine must be dismantled for bearing overhaul and, to some extent, whether the crankshaft must be reground. Glacier 20% reticular aluminium-tin had been designed to run against unhardened shafts (down to 200 Brinell) and long-term tests were set afoot in the Company's and customers' motor vehicles to assess wear performance with soft shafts. In recent years, the distance run by vehicles between overhauls has increased considerably, and this means that very large distances must be run to assess the material. The copper-lead bearing materials which run with hardened shafts have excellent wear properties as long as the lead-tin or lead-indium overlay is not worn off. Once it has been worn through, after say 75,000 miles (120,698 kilometres), the shaft wear rate against the hard copper-lead or lead-bronze is extremely rapid. Typical comparative wear rates are shown in Figure 8. 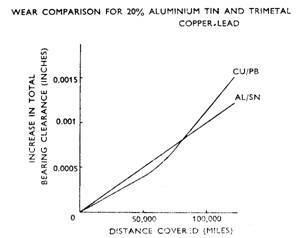 Initially the wear rate with both materials is small, although slightly more rapid with the aluminium-tin material, until at, say 60,000 miles (96,558 kilometres), the overlay is worn off and the copper-lead wear rate increases. If the engine is dirty or filtration neglected, the increase of the wear rate of plated copper-lead will occur earlier in the life of the bearing. Figure 9 shows a typical set of main bearings where the wear rate of the plated copper-lead bearings has become accelerated. The overlay has been removed in certain areas and the hard copper-lead exposed. It was also found that if engines containing aluminium-tin bearings were inspected after short periods of running, early in their life, they appeared to be wearing more quickly than plated copper-lead. It was quickly found that this was a visual effect due to the absence of an overlay and could be ignored. The final formal wear test of the material was a 60,000 mile (96,558 kilometre) run at 60 mph (96.6 kph) with 1,000 cold starts of six 1,000 cc British cars, three fitted with Glacier 20% reticular aluminium-tin bearings and three with a competitor's overlay plated lead-bronze bearings. In each case, the total change in bearing clearance in the vehicles fitted with Glacier bearings was less than in the others. The results are summarised in Table 5. A set of 20% aluminium-tin bearings after completing the test shown in Figure 10. In order to demonstrate that the material could survive not only under somewhat sheltered test conditions, a 10,000 mile (16,093 kilometre) test under racing conditions, including participation in actual races, was carried out in a BMC Cooper car. 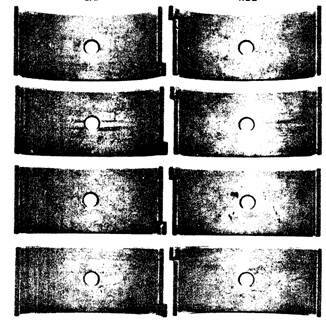 The condition of the bearings, which is excellent, is shown in Figure 11. Since this development stage, considerable service experience has been gained, where the reticular aluminium-tin bearings operated under severe conditions for long periods. An interesting published example of this is an article in the British "Engine Design and Application" for September 1965 where Perkins Engines Ltd. describe the successful performance of one of their 6.354 engines in 320,000 miles (514976 kilometres) uninterrupted service. In this case, in common with other engine components, the reticular aluminium-tin bearings were in excellent condition and fit for further service after engine overhaul. A very useful additional benefit from the reticular aluminium-tin structure – and one of particular use to the engine reconditioning industry is that the bearings are resizable. Prefinished white metal and plated copper-lead cannot be resized for obvious reasons but the homogeneous structure of reticular aluminium-tin enables engine reconditioner to resize these bearings to suit a particular shaft size should this be necessary. Figure 4. Single-head, dynamically loaded, bonded to steel, bearing fatigue test rig. Since reticular 20% aluminium-tin was introduced by Glacier and its Licensees some ten years ago, it has taken a prominent place in bearing materials used in Britain and in Europe. It is used as original equipment by BMC, Vauxhall, Ford (England and Germany) and Rootes, in their passenger cars and trucks and is also specified by the larger British commercial vehicle manufacturers, AEC and Leyland. A list of users of the material is given at the end of this article. The material is also used in larger stationary and marine-propulsion diesel engines, in diameters up to 10" (254 mm). It is also being used almost universally as the material around which new engines are designed and developed. This success arises from the fact that, for the first time, a bearing material has been specifically formulated and developed for the work it has to do and the market it has to serve. Into Glacier 20% reticular aluminium-tin bearings are built the qualities of strength, melting point, corrosion resistance, embeddability, conformability, hardness and surface condition in the proportions which are required to fit exactly for the bearing requirements of the engines of today and the future. Figure 5. Layout of loading system for machine in Figure 4. Figure 6. Multi-head, dynamically loaded, bearing fatigue test rig. Figure 7. Arrangement of test head on machine in Figure 6.
and an overlay plated copper-lead material. With respect to Javelin Models PA, PB, PC, PD and PE, and Jupiter Models SA and SC the main bearing and big end bearing journals can be ground to the following under sizes – 10, 20, 30 and 40 thou. The following grind specifications apply for the reticular aluminium-tin bearing surface use. It should be noted that, if a white metal rear main bearing set is used in conjunction with reticular aluminium-tin bearings at Nos. 1 & 2 main bearings, the grind tolerances shown in the Maintenance Manual apply to the rear main journal only.